This post comes from high above the Thai skies, as I fly back from the second of my two-pronged first stab at the northeastern Isaan region. Having kicked off in the small provincial capital city of Chaiyaphum, I am now on my way back to Bangkok from Khon Kaen. Khon Kaen was one of the big winners of the north east’s economic boom, and it shows in a city that boasts a well-developed road system, an international airport, and shopping centres that cast an unlikely western influence over life here. Yet this is by no means tourist mecca; it’s a city of contrasts, because in spite of the fast-paced development, traditional life goes on, and as a farang you get just as many curious stares as you would in a small village – more even. Both Chaiyaphum and Khon Kaen make for refreshing breaks from the hustle and bustle of busier parts of the country, though the traffic on some of Khon Kaen’s roads can in itself be reminiscent of a small-scale Bangkok. Chaiyaphum, far less developed, is yet to make it anywhere near tourist land – I spent a good five days there without seeing a single western face, until my last day, when I saw three (it seems tourists are like buses!) Yet it, too, has its own charismatic appeal – the real joy being in the ease with which you can get off the city’s main roads and out into rice-padddy fringed country lanes, chat with old Thai ladies as you grab some huge Isaan-style grilled chicken skewers and fresh pineapple, and then take in the fresh air and green landscape by the edge of a chilled lake. Khon Kaen’s lake, too, is a draw – a huge monster of a reservoir, the three-shaded paths that line it attract friendly folks, the sort who are up for a chat in ways that many in a city aren’t. The bloke who had pulled up with his bike and his lunch, the loved-up school-aged kids on their mopeds, or the shrinking old man who spoke better English than a lot of Thai people I’ve met, and was very keen to practise it before he jogged off on its merry little exercise routine. He must have been 70 if he was a day. The best thing about Khon Kaen, though, is that it lives and breathes for food – food is everywhere. 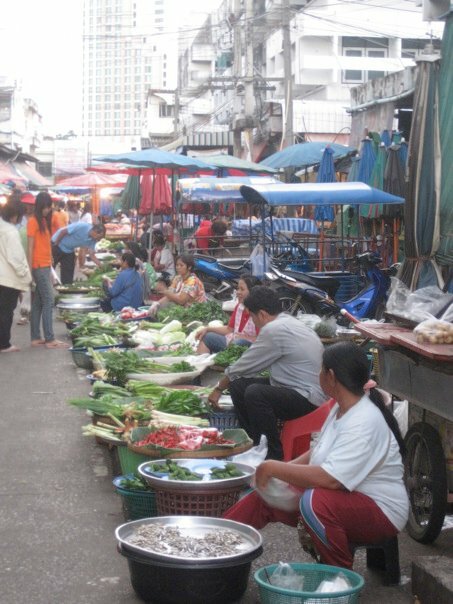 The streets of food markets, the fresh produce laid out on simple crates on tables and the floor, is enough to leave any foodie wide-eyed. Every imaginable fruit, vegetable, salad leaf, meat and fish…buckets and buckets of prawns, squid, all caught locally and still eye wateringly fresh. And the buzz of the night market; where other cities grill cheap cuts of chicken or pork, in Khon Kaen the 10B skewers sizzle with juicy pieces of squid. The endless stalls and plastic chairs, and one stall in particular with the best satay around. This is a city which is also crazy about coffee – iced coffee stalls abound, and the quality is certainly better than most. It’s a city that makes you desperate to have a proper home here, with a proper kitchen where you could put all of these amazing ingredients to use – and both Khon Kaen and Chaiyaphum make for a tantalising first dip into Isaan.